MUMBAI, India — The Mumbai Trans Harbor Link, a 14-mile series of pillars supporting an eight-lane highway and a rail line, was supposed to be an artery relieving pressure on India’s financial capital, while feeding a new city and fresh growth. The trouble is, it has never been built. Instead, the project — which would be the country’s longest sea bridge and is now estimated to cost $1.5 billion — is both a symbol of India’s emerging economic aspirations and the entrenched bureaucracy hindering its development. Proposed in the early 1970s, the bridge was designed to relieve traffic congestion in Mumbai by reducing travel time between the city center and Navi Mumbai, or New Bombay, to the north. “Navi Mumbai was conceived as a well-connected parallel city that would act as a magnet and pull businesses, banks and state administration toward that area and take some pressure off the city,” said Pankaj Joshi, director of the Urban Design Research Institute, a planning and conservation organization for Mumbai. The Mumbai Trans Harbor Link is one of numerous infrastructure projects in India that are sorely needed to create economic growth but have stalled because of seemingly intractable red tape. Projects worth $110 billion have been delayed by difficulties in acquiring land, getting environmental and other regulatory approvals, and obtaining long-term financing, according to data compiled by a consortium of state-run banks last March. As government officials in India increasingly find themselves embroiled in allegations of corruption, they have become wary of making swift decisions. While private sector spending on infrastructure has increased 10 times over the last decade, the government is seen as falling short in handling contracts and disputes. “To facilitate the development of infrastructure, there needs to be a time-bound program for giving clearances for projects, along with cohesion between the state and central governments for policy implementation,” said Seshagiri Rao, joint managing director and group chief financial officer of JSW Steel, a unit of the construction company JSW Group. Officials overseeing infrastructure development struggle to reconcile the concerns of various departments whose clearances are required for each project. Since July, a committee started by Prime Minister Manmohan Singh has given fast-track regulatory approval to 125 previously stalled infrastructure and manufacturing projects worth $64 billion, but that is still considered inadequate. “This is not a solution for the industry’s problems. This is an exercise in crisis management,” said Madhu Terdal, chief financial officer of GMR Infrastructure, a Bangalore-based builder of airports, energy projects, highways and urban infrastructure. The state of Maharashtra, which includes Mumbai, gave the Mumbai bridge project the green light in 1996. But environmental clearance from the central government — the last of the regulatory approvals required — came only in October 2012. Over those years, India’s economy has gone from a boom to a slowdown, and potential builders are now less than eager to sign on. The Mumbai Metropolitan Region Development Authority has opened the project for bidding as a public-private partnership three times since 2008, each time failing to elicit adequate response from private companies. In such a partnership, the builder would collect tolls to recover costs and make a profit. In the most recent tender, last August, construction companies pointed to reduced traffic forecasts stemming from the economic slowdown and delays in building an airport for Navi Mumbai, affecting the projected revenue from toll collections. Since 2005, the estimated cost of the project has more than doubled, from $632 million. Now, the state government is considering using a cash contract — in which the project is funded entirely by the government but built by a private contractor — and is looking to raise debt from foreign funding agencies. While the official estimate for completion is 2019, further delays are widely expected. Over the last year, economic malaise, slowing demand and rising interest rates have put infrastructure companies in a financial bind, and this has increased the difficulty in finding a contractor for the bridge. “Despite the fact that we had substantially de-risked the project when we restructured it, the private sector failed to respond because most of the Indian companies that we had shortlisted were facing their own financial issues,” said Ashwini Bhide, who oversees the bridge project and other infrastructure programs at the Mumbai development authority. A Credit Suisse report last August found that infrastructure companies like the Jaypee Group, GMR Infrastructure, GVK, Lanco Infratech and the JSW Group were among the Indian conglomerates with the highest debt. Many of these companies have begun to sell assets to pare debt, and some are considering raising money overseas through equity issues. In March, GMR Infrastructure offloaded $327 million worth of assets to lighten a debt burden that was recently still about $6 billion. 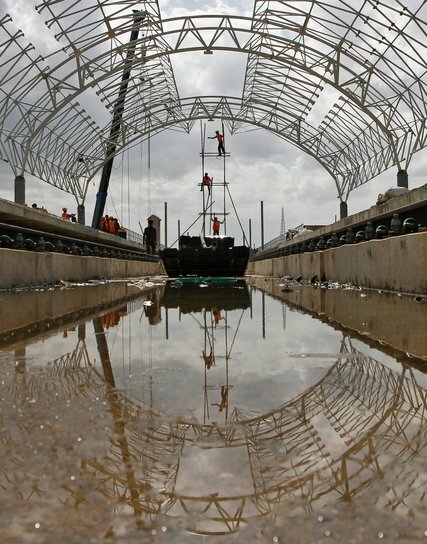 The lack of long-term financing for infrastructure companies is another hurdle. During the October meeting of the Group of 20 finance ministers in Washington, the Indian minister, P. Chidambaram, said development banks such as the World Bank should help ensure financing for infrastructure in developing countries. India introduced its own infrastructure debt fund last June. Published in print and online, The New York Times; January 15, 2014.